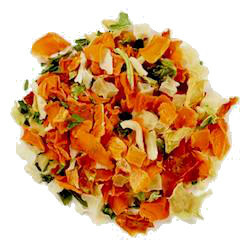 Vegetable Soup Blend is a convenient mix of veggies like carrot, onion, potatoes and tomatoes for making soups and other dishes calling for cooked veggies. Directions: Add 1/3 cup per 8 ounces liquid and simmer until tender. Use in soups and stews or reconstitute to use in any dish calling for cooked vegetables. Ingredients: organic potatoes, carrots, onion, tomato, parsley, spinach, bell peppers.